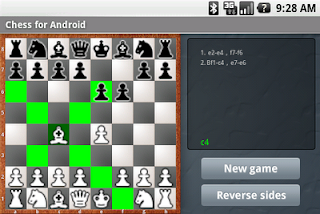 Version 1.2 of Chess for Android at the Android Market has several improvements. The first is the much requested "undo" feature, where up to eight plies (half-moves) can be taken back to correct mistakes in the input (or mere blunders, as for black in the screenshot below!). The second is a "free play" option, where the phone can be used as a "magnetic chessboard" to study games, or play a game up to a position for further play with the chess engine (this option, like the different levels of play, can be found under the "Menu" button). Furthermore, move highlighting has been modified with a black border, which looks slightly better along files and ranks. Finally, a few rules were added to evaluation function of the chess engine. 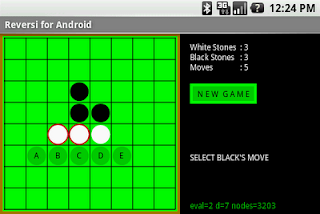 Version 1.2 of Reversi for Android at the Android Market now highlights the new and flipped white stones after each computer move with a red border, as shown below. Hopefully this will make it more clear what was played last. Perhaps a surprise to some, but I don't actually have the G1 Android phone myself yet. Instead, I developed the three game applications on the Android emulator. This unfortunately also implies that I cannot read the comments that were posted at the Android Market, I only can see the average rating. As such, I just get a sense of user feedback from emails I receive. To my great surprise, quite a few users complained that captures should not be mandatory in the just released Checkers for Android, even though the official straight checkers rules clearly state that jumps are forced (something that in my opinion adds to the beauty of the game). Nevertheless, since this seems a popular feature request, I just posted an update at the Android Market in which the user can chose between mandatory or optional captures prior to the game. The latter option does not follow the so-called "huffing" rule, where the piece that should have performed the capture is forfeited. Instead, the game simply continues, which may lead to some interesting draw situations. The number of downloads of Chess and Reversi for Android exceeded all my expectations, and I received a lot of nice feedback. The most popular request was for a checkers application. 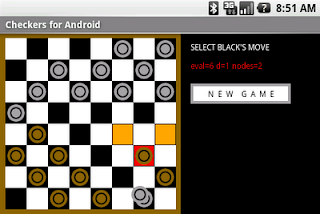 So I gave it a try and implemented Checkers for Android which, like Reversi and Chess for Android, is available for free at the Android Market. Some screen shots are shown below. Since captures in checkers can consist of several jumps, I tried a new input mechanism where touching a square shows all valid moves that involve that square. By clicking on those squares (making orange colors red) eventually a move is uniquely defined. 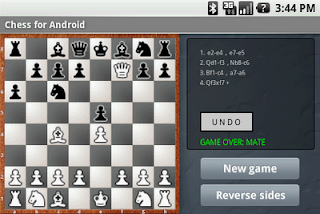 Also, the last played move is highlighted on the board (a feature requested for Chess and Reversi as well). The checkers engine plays at various levels (including random).